Repeated, periodic attacks of one-sided throbbing headache made worse by activity and lasting 4-72 hours. The headache is accompanied by nausea, vomiting, photophobia, and/or phonophobia. There is often an early warning phase involving mood swings, food cravings, excess energy, and cognitive impairment for several hours prior to the onset of headache. Once the headache has resolved, it is typically followed by several hours of fatigue, cognitive impairment, allodynia, and/or depressed mood. Migraine is often thought of a severe headache. While this is true for many, not all migraine attacks involve severe pain. In fact, it is possible to experience ancephalgic (silent) migraine attacks in which there is no pain at all. It is the accompanying symptoms that distinguish migraine from other types of headache disorders. Repeated, periodic attacks that begin with sensory changes such as zigzag lines, blind spots, or flashing lights that block normal vision. These nervous system changes are followed by headache lasting 4-72 hours in addition to nausea, vomiting, light sensitivity or sound sensitivity. Formerly called basilar migraine, Migraine with brainstem aura is similar to Migraine with aura except that the aura is of a different quality. Hemiplegic migraine is similar to Migraine with aura except that it involves motor weakness that cannot easily be distinguished from stroke without brain scans. Headache specialists use the International Classification of Headache Disorders (ICHD-3) to diagnose different types of migraine. 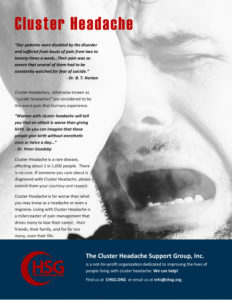 If your doctor is not a headache specialist, he or she may offer you a descriptive diagnosis instead. Unfortunately, most doctors do not have the appropriate training to diagnose such a rare type of migraine. Patients and doctors alike use descriptive terms to describe all kinds of visual disturbances associated with migraine. Many patients have been told they have "ocular" or "ophthalmic" migraine when there is no such diagnosis. To make matters worse, doctors do not refer to a standard set of criteria when using these terms. Documented and prospectively-recorded evidence over at least three consecutive cycles has confirmed that attacks occur exclusively on day 1 ± 2 (ie, days −2 to +3) of menstruation in at least two out of three menstrual cycles and at no other times of the cycle. A debilitating migraine attack lasting for more than 72 hours. Status migrainosus should be evaluated by a headache specialist to rule out other problems and treated to break the cycle.